Peter Drucker once remarked that the second career was the most meaningful. On average one Baby Boomer retires every seven seconds in the United States, and Wycliffe Associates is tailoring its programs with this in mind. Indeed many who will take vacations in this category will spend it doing volunteer work overseas. Wycliffe Associates has built a new Volunteer Mobilization Center in Orlando, Florida, to recruit, train, and mobilize the service contributions of what is expected to be a continued influx of mature, skilled volunteers. Boomers make up a quarter of the total population in the United States. Dr. Todd Johnson, a research fellow and director of the Center for the Study of Global Christianity at Gordon-Conwell Theological Seminary, confirms that Boomers are more interested in being active than just giving money. Many are starting NGOs, non-governmental organizations such as orphanages, business centers, and health clinics, that minister at a local level. “Many retirees’ post-retirement plans are being built around missions,” stated Dr. Johnson. Although Boomers are sometimes branded as a very self-centered and individualistic generation, many are experiencing a deepening desire to give back—not only by volunteering domestically, but also by doing volunteer work abroad. They are coming to realize that significance is found in looking beyond oneself, studies show. Christian organizations such as Wycliffe Associates believe they have a great opportunity to match mature, highly honed skills with ministry opportunities in missions that allow them to do volunteer work overseas. It is cheaper these days to go overseas. The entire world is more accessible. Today’s 60-year-old is mature and needs far less training in living skills than his or her younger counterpart. Traditionally, mission organizations send new missionaries in their 20s and 30s through an orientation process, like a jungle camp, to learn how to survive the harsh living conditions in the field. But a person in his or her 50s and above has triumphed through their productive years and has built in strategies for success. Wycliffe Associates has experienced this phenomenon among its own ranks. One such boomer is Michael Willard, a retired U.S. Army Special Forces engineer, who is taking his skills to the mission field. Spending his career designing and building airstrips for C-130 and C5 Galaxy Air Force jets, Michael’s skills, abilities, and experience are highly valued in places like Papua New Guinea and Africa. Without air transportation, small villages and the missionaries who work there would be at risk of greater isolation from medical and food supplies. Michael was part of a special unit in the Green Berets and oversaw the establishment of military airstrips in jungles and other remote places. He used these skills to do volunteer work abroad in Papua New Guinea where the local people rely heavily on small airplanes for transportation, as there is very little in the way of a highway or rail infrastructure. The jungle grows very thick and fast, and as it does, airstrips need continuous maintenance and care. Recently, dozens of airstrips were too dangerous to land a plane and had water damage beyond repair. One particular airstrip had been torn apart by a small volcano. An example of putting his professional skills to the task of missions, Michael and his teams restored 10 airstrips in Papua New Guinea. Time magazine reported that Boomers volunteer at a rate of 33 percent, contrasted with 24 percent for those 65 and older. Last year, 65.4 million people did volunteer work but 75 million volunteers will be needed in 2010, Time reported. The need for Boomers to do volunteer work overseas is there and Wycliffe Associates currently has over 1,600 unfulfilled international positions. Wycliffe Associates is responding quickly to inquiries and then matching volunteers with appropriate volunteer work abroad. The organization has built the Volunteer Mobilization Center in Orlando to help coordinate the volunteering. The benefit to adults who feel God’s call to ministry in the second half of life is an enriching experience as they use the skills and knowledge gained in their younger years for eternal purposes. Free from the pressures of youth and middle age, the older adult can do exciting, meaningful things never dreamed of before. As hundreds of thousands of new volunteer missionaries rise from the ranks of retiring Baby Boomers, they will challenge the status quo of missions and how organizations will respond to them. Wycliffe Associates is positioned to usher in a new era of evangelism, Christian service, and missions by involving thousands of Boomers in the acceleration of Bible translation worldwide by equipping them to volunteer abroad. Side note – clean water is one of the largest obstacles to Bible translation in Africa and Asia. Besides political and religious persecution, having clean water means that Bible translators and the people they serve can avoid disease and find ways for small communities thrive. Until now, the Bible translation center never had running water. In the Democratic Republic of the Congo (DRC), in the city of Gemena, a Bible translation training center is budding. And that’s largely due to a new water project made possible by friends like you. 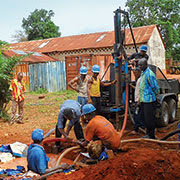 Through your support, a new 150-foot well has been drilled at the center and a 5,000-liter water tower has been built. A distribution system also was installed to run water from the tank to the office building, as well as outside of the center for community use. This is the first time the translation center has ever had running water! Needless to say, it will be a boon to Bible translators and their important work. To further accelerate their translation efforts, Wycliffe Associates also has made a commitment to renovate a storage building into usable translation office space. This is such great news, not just for Bible translators and surrounding villages, but also for the countless people in the DRC who do not yet have a single verse of Scripture in their heart language. ¡SUCCESS ONLINE MLM te ha invitado a que te unas a Twitter! Twitter te ayuda a estar conectado con lo que está sucediendo en estos momentos y con las personas y organizaciones que te importan. Puedes anular tu suscripción a estos correos electrónicos en cualquier momento o encontrar respuestas a tus preguntas en el Soporte de Twitter. (Orlando, Florida, USA)—Wycliffe Associates, an international organization that involves people in the acceleration of Bible translation, is raising emergency funds to assist Bible translation teams and their families in the Philippines whose homes, offices, and computer equipment have been destroyed in the aftermath of Typhoon Haiyan, which struck the nation on November 8, killing over 5,000 people and displacing 4 million. Of the 163 languages in the Philippines, only 100 have Scriptures translated in their heart language. There are 63 more that still need to be completed. Wycliffe Associates has been supporting Bible translation efforts in the Philippines over the decades with a variety of services, including construction projects and the recruitment of teachers for Faith Academy, a K-12 Christian International School with campuses in Manila and Davao City. Faith Academy has reported that its students and staff are safe following the typhoon. Wycliffe Associates maintains the Missionary 911 Fund for ministry partners who are affected by natural disasters or civil unrest. The emergency fund provides help with evacuations, temporary housing, rebuilding, and the replacement of some belongings. Donations to the Missionary 911 Fund will provide immediate assistance to Bible translation partners, their families, and local citizens in the Philippines. Wycliffe Associates involves people in accelerating the work of Bible translation through their time, talents, and treasure. Because millions of people around the world are still waiting to read the Scriptures in the language of their heart, Wycliffe Associates is working as quickly as they can to translate every verse of the Bible into every tongue to change every heart. The organization partners with nationals, mother tongue translators, staff, volunteers, and supporters to direct and fund these efforts, as well as provide logistics, networking, and technical support. Through a growing global network, Wycliffe Associates is striving to overcome local limitations of time and resources to achieve the goal of beginning the translation of God’s Word in every remaining language that needs it by 2025. Last year, the organization mobilized 3,103 volunteers and staff members to accelerate Bible translation in 73 countries. Additional information is available at www.wycliffeassociates.org or by calling 1-800-THE WORD (1-800-843-9673).